Spring has officially sprung! 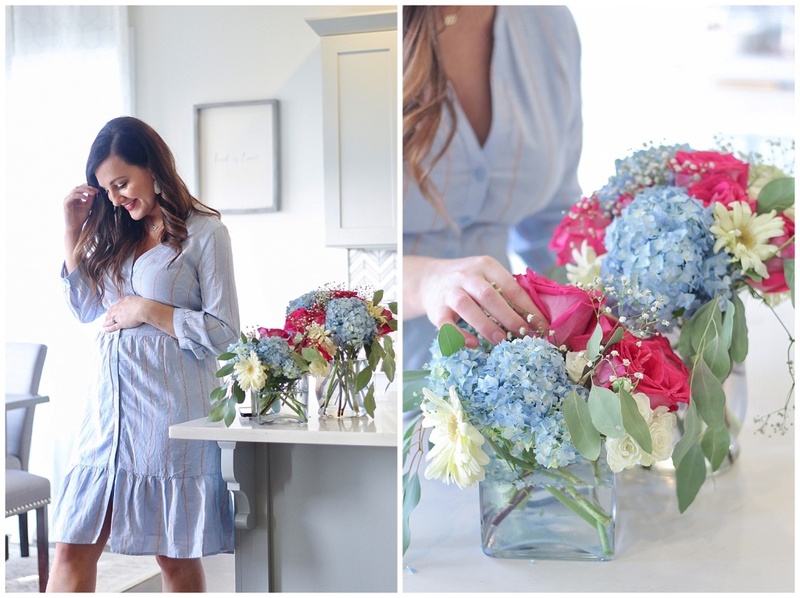 And what better timing than to share these gorgeous floral arrangements I put together for our Gender Reveal Party earlier this month. 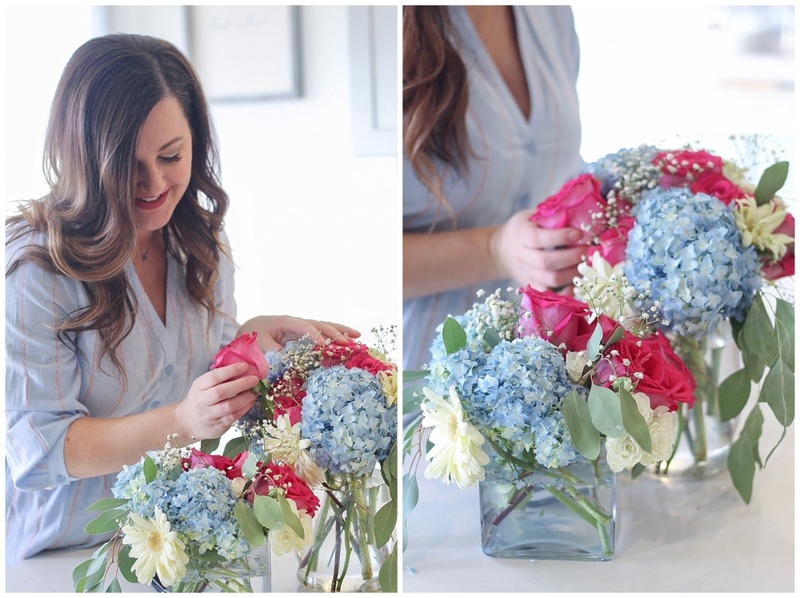 When planning for the party, I knew I wanted some fresh flowers dispersed around the house. It always makes everything look put together and classy. And I knew my color palette would be pinks, blues, and ivory. Pink and ivory are both easy to find in fresh flowers, but I knew blue would be difficult to find. 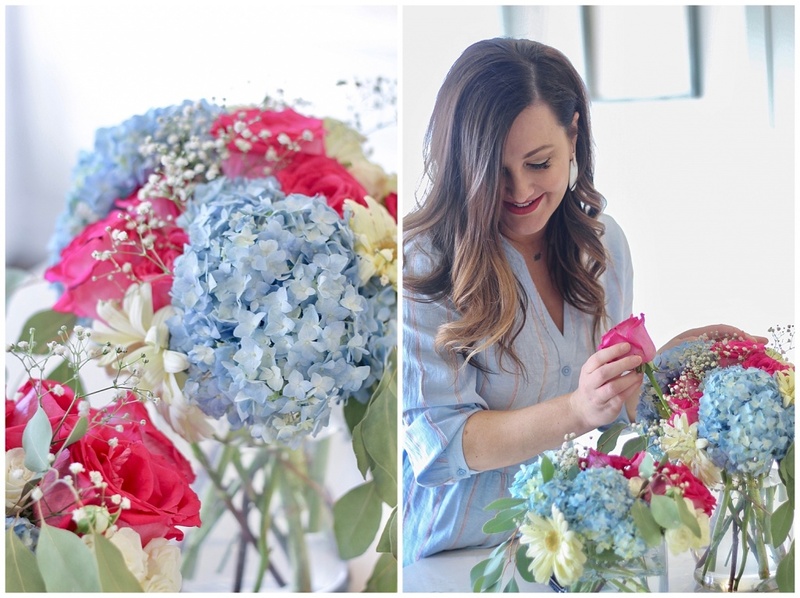 Thankfully, Trader Joe’s has the most gorgeous blue hydrangeas- which were great space fillers and SUPER CHEAP! And I was obsessed with the eucalyptus leaves I also found at Trader Joe’s. They were the perfect unique touch and added some greenery to the color scheme. With the help of Trader Joe’s and Kroger, I was able to make 4 large arrangements for only $45. 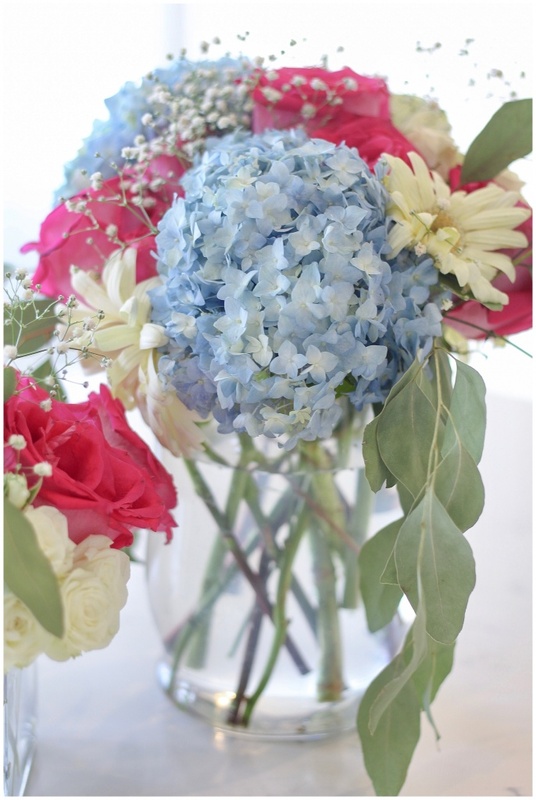 When making fresh flower arrangements, it is important to gather a variety of flower types. 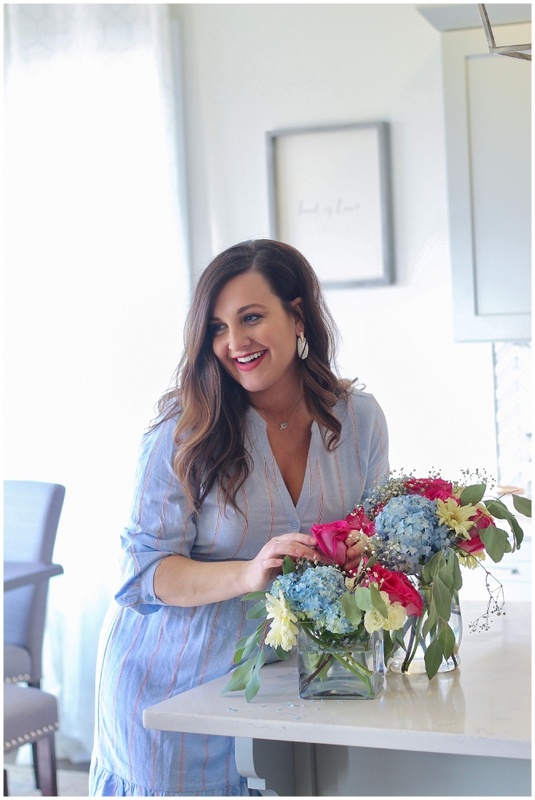 Fillers: these are your favorite flowers that you want to include, but may not always take up a lot of space, such as roses, daisies, carnations, etc. They will be the rest of the space that the bulky blooms did not cover. Sprigs and Accents: Be sure to include smaller accent plants throughout the arrangements. These are often greenery or small blooms and will be added to the arrangement at the very end. I like to use baby’s breath, eucalyptus, wax flower, even dried wheat. I also like to create different “levels” of arrangements. Essentially, just varying heights, shapes, and sizes. I have a few vases that I have saved over time that vary in size and shape. This adds to variation to your decorations and can be used anywhere appropriate for the sizing need. Always keep your vases filled with fresh water. 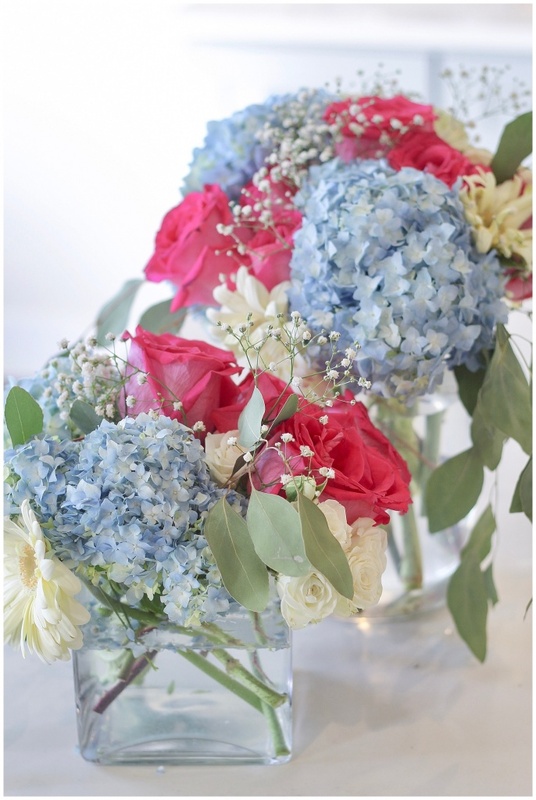 With larger blooms, cut the stems at an angle and for hydrangeas, add a vertical slit in the middle of the cut. Use the flower food provided with your store-bought flowers. Mix with the water so the food is dissolved. 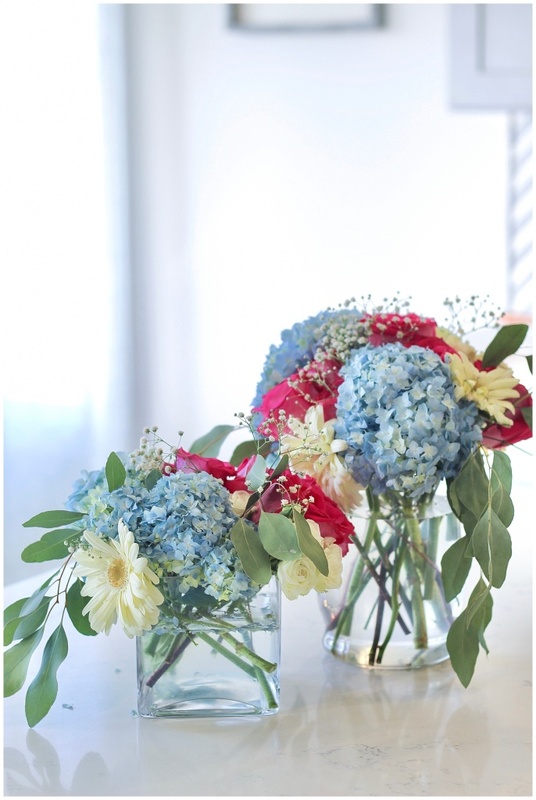 Remove most (if not all) leaves from the flowers so they do not fall off into the vase. Plus, it removes a lot of the unnecessary greenery from your arrangements. 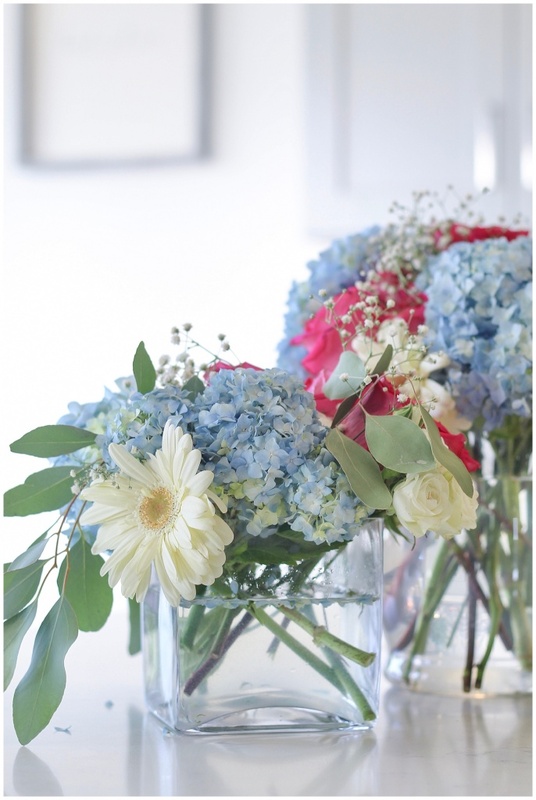 Put your bouquets in a cool, draft-free area. Avoid direct sunlight, which causes the flowers to die more quickly. 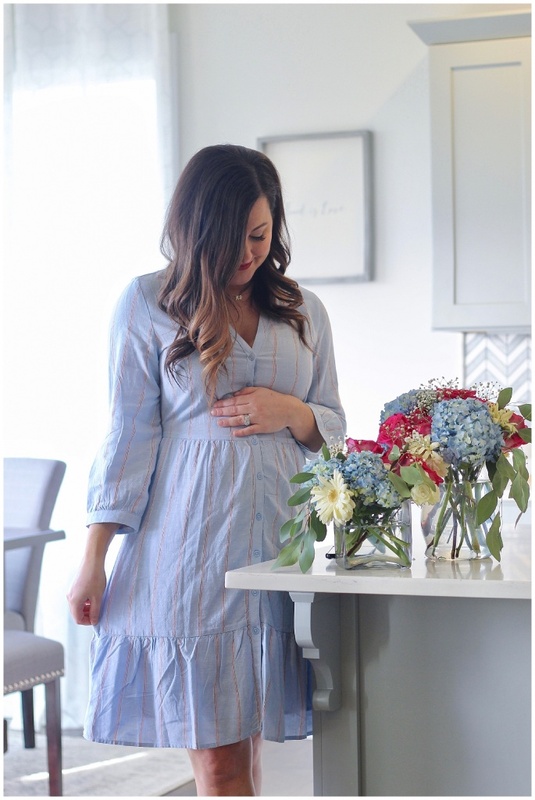 A little outfit details- I got this non maternity dress from Old Navy and it was the perfect color scheme for a gender-reveal shoot. While I did not wear this to the actual reveal, it is very comfy and super affordable. You can shop in the details below.